As a result of the jump, Felix Baumgartner now holds the record for completing the highest-altitude jump and highest manned-balloon flight. He did not however break the record for the longest fee-fall as he had hoped. This is still held by retired U.S. Air Force Col. Joe Kittinger’s 1960 jump.Kittinger, who served as part of Baumgartner’s support team for this attempt, spent 5-minutes-35-seconds in free-fall during his Air Force mission jump while Baumgartner was in free-fall for 4:20 before pulling his chute during the Red Bull Stratos jump. 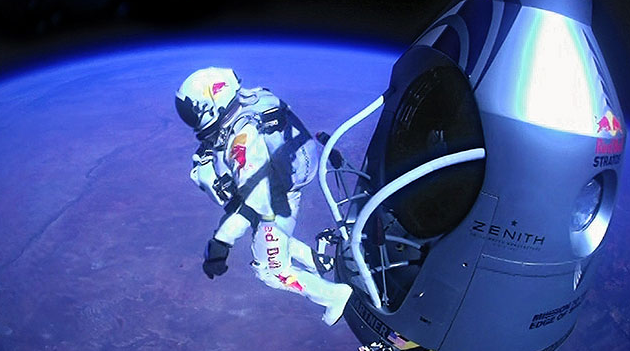 According to Baumgartner, the Red Bull space jump was between five and seven years in the making. The budget associated with this visionary (and now highly-successful) project are unknown, but the figures are probably also somewhere in the stratosphere. To see a ton more on the jump go over to Red Bull’s media site here.